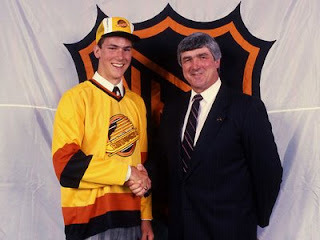 On April 11th in 1970, Trevor Linden was born in Medicine Hat, Alberta. Fresh off consecutive Memorial Cup wins, the Canucks selected him second overall in the 1988 NHL Draft. Linden would play 16 of his 19 NHL seasons with the club earning the nickname Captain Canuck for his on-ice efforts and community contributions. In his first season, Linden scored 30 regular season goals and added seven playoff points in a first round series against the heavily favored Flames. Predicted by local media to be the first seven game series to be settled in three games, Linden et al took the eventual Cup winners to overtime in Game 7. The rookie performance landed Linden runner-up honors in the Calder Trophy race and cemented his reputation among the Canuck faithful. Two years later he would be crowned captain. Linden ended up posting six 30+ goal seasons during a 482 consecutive game ironman streak in Vancouver. The highlight of his career came when he captained his banged up seventh seeded Canucks to the 1994 Stanley Cup finals, leading them out of a 3-1 game deficit against the Presidents' Trophy winning New York Rangers to force an infamous Game 7 at MSG. Linden scored both Canuck goals in the 3-2 loss. A 1998 run-in with notorious new coach Mike Keenan launched a three year eastern conference tour with stops in Long Island, Montreal, and Washington. That year Linden would also be elected President of the NHLPA, a position he held for eight years. 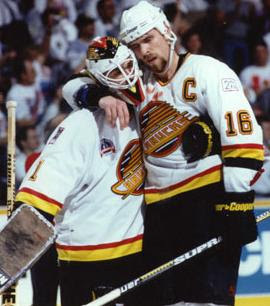 In 2001 Linden returned to Vancouver, ending his career in an April 5, 2008 home game against division rival Calgary Flames. Despite an embarrassing 7-1 loss, the Canucks' favorite son was applauded throughout the third period and named the game's first star. At the end of the game, Flames captain Jarome Iginla ordered his team out of the dressing and back on the ice to congratulate the Albertan in person. 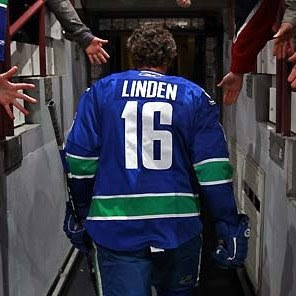 Linden's number 16 jersey was retired by the Vancouver Canucks on December 17, 2009, only the second jersey to be retired by the franchise. On April 9, 2014, Linden was named President of Hockey Operations for the Vancouver Canucks, one day after Mike Gillis was relieved of the role.